I have never really tried Olay products, mostly due to the fact that I have access to many salon brands that I love and used when I was doing facials. 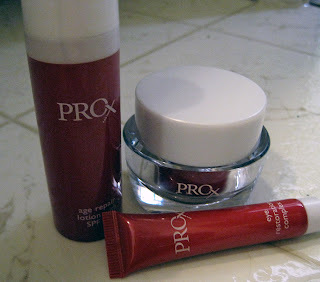 Recently though a friend of mine who is nearing 40 told me that she had been using the Olay ProX Intensive Wrinkle Protocol, a starter kit of products from the company's high-end skin care line. She insisted that she had noticed a significant improvement in the wrinkles around her eyes and mouth. She also said that here skin felt smoother than it had in years, so when I was given the chance to try this product I jumped at it! Age Repair Lotion with SPF 30 - This is to be applied liberally in the morning. It contains lactic acid which is a mild AHA and vitamin A. This product seems primarily be for protection (SPF 30). You may also get mild exfoliation from the lactic acid. Wrinkle Smoothing Cream - This product is meant to be used at night. The cream contains vitamins A, B, and E, all of which are known to refine skins appearance and smooth wrinkles. Eye Restoration Complex - This is meant to be used around the eye area. The directions say to use it day and night for best results. The main ingredient in this product appears to be caffine, which is known to reduce puffiness. * I wish that the directions on eye creams stated that you should apply with your ring finger, not your index finger. The ring finger is weaker than the index and using it will eliminate tugging around the eye area. Also, pat eye cream on, do not rub it in or pull at the skin around the eye. I have been using this now for about 2 weeks. I noticed a definite improvement in my skin's texture within a few days, but it has not been long enough to tell if it will really help eliminate wrinkles. The one product I do not care for is the eye cream. It is mostly silicone and when I used it my eyes feel slightly irritated for an hour or so afterwards, so I have stopped using it. My eyes are sensitive when it comes to creams and lotions, so the problem may be me and not the product. For the $60 price tag I expect to see some noticeable results over the next few months. I'll let you know! I got to know about a website myskin.com via facebook. They have recommended a number of suitable anti-wrinkle creams and treatments considering my skin profile and the results are wonderful. Have a peep using ‘greatskin’ as an invite code.